This guitar reminds us just how valid this platform is for the contemporary player. We hope we're as spritely at that age! Distinctive and quirky design with good specification. The nut is cut a fraction too low on our sample; this is not a cheap instrument. Our review guitar calls to mind the Junior and Special's legacy. It is styled after the single-cut version (rather than the post-'58 double-cut 'revamp') with simple controls and traditional passive electronics. It addresses the traditional 'single-cut' issue of limited-upper fret access with similar offset, contoured neck-to-body joints (glued-in, of course), with 22-fret bound-edge rosewood 'boards and medium jumbo frets. The AXL features a double-bound mahogany slab body resplendent in glossy Orange Sparkle; its one-piece mahogany neck is chunkier and features a kitsch 50s-style headstock logo. 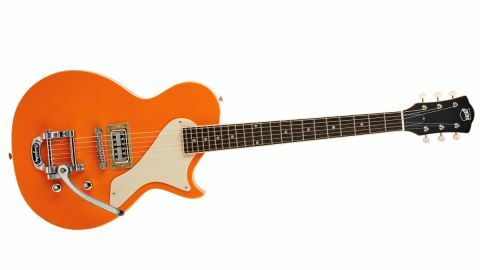 In the way that Fano has created a hybrid of Gibson and Fender styles with its SP6, for example, this AXL mixes in Gretsch twists to the hallowed Gibson formula, with a Bigsby vibrato and Power'Tron pickup. AXL USA prides itself on using only the finest components, and the spec sheet boasts CTS pots and Orange Drop capacitors, not to mention the quality TonePros roller tune- o-matic bridge. It certainly makes for some impressive reading. Plugging into our Marshall with the same settings, we're struck by the richness and detail of the Power'Tron. It has slightly less apparent output than the recently-reviewed Schecter Diamond Solo II, but offers a rich, distinctive sound all the same. Pushing the gain/volume tends towards microphonic feedback from the metal covered humbucker, though this guitar feels like it's designed more for characterful textures than anything too 'gainy'. This seems confirmed by the factory choice of 0.011 to 0.049 gauge strings, rather than the Schecter's 0.010 to 0.046 set. Of course, with the single pickup there's no pickup selector to fuss with, just the volume, tone and the very effective coil-split. You'd probably get used to the placement of the controls eventually, but not being able to visually check whether the tone knob is 'pushed or pulled' without tilting the whole guitar up towards you seems a shame. Mind you, the roller saddles and Tusq XL nut certainly do their job and some fairly urgent agitation of the Bigsby doesn't put us out of tune. Like the Schecter, the setup is very comfortable straight from the box, though the low E string slot may have been cut just a shade too low for more spirited twanging. For twangy, ethereal/grunge-style Neil Young- isms, the Bel Air won't disappoint, though you do pay more for that Bigsby, slightly better electrics and fancy finish options.